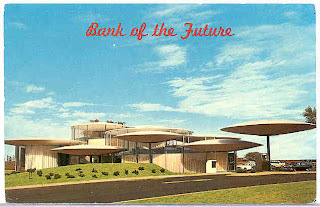 "This is a bank," the sign outside the futuristic building read. According to legend a prankster added a strategic question mark and echoed the sentiment of many passers-by: "This is a bank?" That was back in 1964 when it opened. Today the Arvest on Lincoln Boulevard looks a bit less Jetsonian, mostly due to replacement of structural glass below the "saucers," but it's still an unusual bank. Designed by Robert Roloff of the architectural firm Bailey, Bozalis, Dickinson & Roloff, the State Capitol Bank caused quite a stir in Oklahoma City when it opened. Heck, it's still pretty shocking today! Originally the flying saucers appeared to hover above the building (as seen in this vintage postcard). All the glass that made that effect possible also made heating and cooling an expensive proposition. Security concerns also mandated replacement of those windows with solid materials and small square portholes you see in the photo above. Arvest invested a fortune in the building, which would have surely been torn down if only the economics were considered. Onlookers admire the round elevator (right) that whisks patrons downstairs to their safe deposit boxes- albeit very slowly. 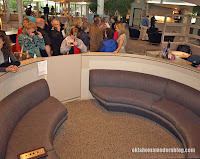 Avid readers might recall Jackie got a chance to "ride" downstairs during our visit to the bank back in February 2007. While the elevator is still operational, it's seldom used today. The control panel can be seen in the lower left of this photo. I'd seen the old postcard on eBay, but had never seen or heard of the building today. I assumed it had been torn down. Thanks for the update!